Today was the second and therefor the important play in the “Relegation”. Yes, I just looked the word up and it meant just the opposite for Dusseldorf today. In the “Relegation” here the the third last of the Bundesliga (German’s Premier league) and the third of the Second Bundesliga play each other for a place in the Bundesliga in the next season. And that’s what they did tonight. Hertha BSC (Berlin’s Bundeliga club) played Fortuna Düsseldorf (Dusseldorf’s second Bundesliga club) in the return game of the “Relegation”. Fortuna had won the first game by 2:1 and were in the better position so I thought it would be a good game to watch in the Altstadt, fierce and exciting probably but therefor a good game. Qnd when Fortuna scored their first goal after 40 seconds everyone was cheering. What followed wasn’t the best game of Fortuna. Hertha scored. Fortuna scored again, Hertha scored again. But Fortuna still stood their ground and the Bundesliga was near. Then the fans took part. They were throwing fireworks on the field, holding up the game for quite some time and we already feared the referee would end the game in favour of Hertha. But he didn’t. It went on but after the usual 90 minutes the referee announced an additional time of seven minutes. It was 2:2 by then but still that was enough for Fortuna to be in the Bundesliga. Everything fine, you would think. Another seven minutes to keep the game at that final score or to make another goal. But then, and it happened too fast for me to quite understand it, in the fifth minute of the additional time, the fans seemed to think the game was over. They stormed on the field, celebrating, taking pieces of the field and everthing. For a moment we were cheering as well until we realised the game wasn’t over yet! 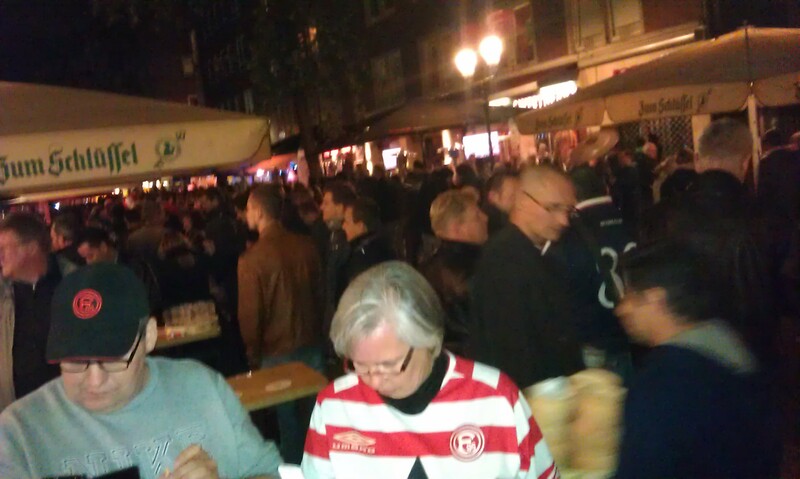 I made it home save and sound from the Altstadt and all those celebrating fans before it started to rain like mad. This entry was posted in Germany and tagged Dusseldorf, Nightlife, Party, Soccer by kathatravelling. Bookmark the permalink.